What Girl Scouts Can Do on Memorial Day! The third line of the Girl Scout Promise states “…to serve God and my Country...” Memorial Day is a great day, for us as Girl Scouts, to remember others who have served our country. How do we do this? This year, Memorial Day is Monday, May 27! Start out the day by participating in your community’s Memorial Day Parade… Wave your flags high and march forward with honor wearing your Girl Scout Uniform. If you are looking for a flag, the GSNC Resource Room usually has some flags for loan, but get there early otherwise they may not have anything left. If your town has a monument to those who served, have your Troop make wreathes and hold a ceremony to place those wreathes at the monument or simply take a Troop trip to that monument to reflect and respect those who served. If you are looking for Memorial Day resources for your Troop visit the GSNC Resource Room or visit the GSNC “Tis the Season” Pinterest Board. Summer may not be here yet, but it will be here soon. Now is the time to start thinking about and planning what you are going to do this summer with your Girl Scouts. Are you going to take a trip to the beach, plan a BBQ (maybe to work on your Junior Simple Meal badge or the Ambassador Dinner Party badge), play some sports or work in the Garden? As you start thinking about your summer vacation, the Girl Scouts of Nassau County Programs Department is busy preparing many exciting experiences and new opportunities for girls to participate in. Camper Badge Program for Juniors - Camping is a great way to share time together. Before you plan your camping adventure, come learn some outdoor skills to use on your trip. You’ll learn what things you need to bring and what to leave home; how to tie some knots, use a map as you take a short hike in the woods and how to cook and clean up. This program is a good way to practice some of your outdoor skills in an outdoor environment. Crossroads Farm for Juniors - Come meet farmer Bill and learn what cold weather crops are and help plant the fall crop on this historic farm. GSNC has partnered with Nassau Land Trust, an organization which helps preserve land on Long Island. You will get a tour of Crossroads Farm at Grossmann’s in Malverne and lend a helping hand at this community garden. Night Owl for Cadettes - Whoooo knows about the night? Come to the Science Museum of Long Island and venture out at night to discover nature on a hike through this lovely property. You will gaze at those twinkling lights in the sky after you have seen them up close & personal in a mobile planetarium. Do you know a few Girl Scout songs or want to learn some? What better way to end the night, but at a campfire! Take Action for the Gold Award for Seniors and Ambassadors - If you are planning to earn the Gold Award, this workshop is for you! Learn the guidelines for the award, what it means to do a Take Action project, important deadlines, the approval process, and what your interview will be like. You will also hear how to make a lasting impact on your community as you live the Girl Scout Law: To make the world a better place! Taste of Camp Weekend - Brownie and Junior Troops can pack an overnight bag, lunch and board the bus at the Girl Scout Service Center in Garden City. Take part in a variety of camp activities including a tour of camp. Leaders will have an opportunity to learn more about what is needed to camp. Join us for a Pizza Party dinner, singing around the campfire and an “Ice Cream Social” to end the evening. It’s not too late to register for camp. Join us at either of our day camp in Wantagh or at sleepaway camp at Blue Bay. You’ll experience the great outdoors and traditional activities tied to theme weeks. Please check the Girl Scouts of Nassau County website under Program Spotlight or Registerfor Programs for registration information. We hope we’ll see you this summer at one of these programs! The best part of having the best job in the world is that I am doing work that I know impacts girls who are growing each day in courage, confidence and character as they strive to make the world a better place . Another outstanding part of the job is that I get to share my joy and conviction with the seven thousand adult Girl Scout VOLUNTEERS who are the "feet on the street"; actually working directly with the girls, as well as those who do behind the scenes work to raise money, do paperwork, and just be helpers. I see girls in programs and activities and I observe their joy, their curiosity and the learning and action that takes place as a result of their being part of the Girl Scout Leadership Experience ... I know that none of it would happen were it not for the boocoodles of time, energy and commitment given by the adults who VOLUNTEER for this job. Terri DellaVecchia , who was recognized by Girl Scouts of Nassau County earlier this month for 70 years of service, said that she stepped forward when she was a senior in high school and someone asked for her to lead a Troop. She's been Girl Scout strong ever since, incorporating Girl Scouting into the fabric of her life and that of her family. THANK YOU, Terri, for your longevity, your service and your can-do approach! When Super Storm Sandy hit Long Island last fall, some of our communities were harder hit than others. When the Girl Scout Leaders in East Rockaway could not be reached by phone or email, Pat Hickey got out her Leader List and headed to East Rockaway to knock on doors and let those Leaders know that their Girl Scout sisters were there for them and to hear firsthand what help they needed. THANK YOU, Pat, for literally going the extra miles. Mark Florio is an Eagle Scout, a Vice President of the GSNC Board of Directors, Chair of the Finance Committee, husband of a Girl Scout Leader, and the father of three daughters. Mark receives all of the Council's monthly investment statements, he reads and analyzes them, and then prepares his own report to the Board. Mark epitomizes fiduciary responsibility and leadership, and his work remains quietly in the background. And when he first joined the Girl Scouts, he was a newlywed and none of his girls had been born yet! THANK YOU, Mark, for sharing your brainpower and espousing continued stewardship of the Council's assets. Three stories down and about 6997 to go ... Every Leader, every Cookie Mom and Dad, everyone on the Service Teams, and those who do Outdoor Training, serve on Committees, do the work of governance, and lend their hands for events ... EVERY VOLUNTEER HAS A STORY ... Please share yours with us! City Scrambler 2013 was a Success! Girl Scouts of Nassau County's City Scrambler 2013 was a Huge Success! As many of you see from our Facebook and Twitter postings, as well as what we post on our Programs page on our website, GSNC offers a variety of programs for girls of all ages that develop skills that build courage, confidence and character. From learning how to tie knots in the Camper Badge program and baiting fishing line in the I Fish NY program to drawing comic strips in the Comic Artist program and star gazing in the Night Owl program, girls have the opportunity to participate in a wide array of programs that may suit many different interests. Last weekend, I had the privilege to attend GSNC’s City Scrambler 2013. The Fourth Annual City Scrambler focused on the beauty and history of lower Manhattan. It was a fun-filled day that tested the skills of a team. Working together, the girls and their team volunteer navigated the streets of lower Manhattan, completing activities to accumulate points at locations like Battery Urban Farm, Alexander Hamilton U.S. Custom House, Fraunces Tavern Museum, Robert F. Wagner Park, Bowling Green Park and Stone Street. At Robert F. Wagner Park, girls learned about and drew ledger art and then told the story of the artwork they created. At the Alexander Hamiliton U.S. Custom House, teams had to determine the names of the statues based on the history that surrounded them. 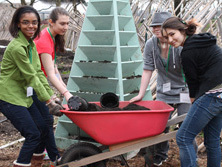 While at Battery Urban Farm, the teams worked with other teams to build Strawberry Towers; filling the structures with dirt and then planting strawberry seeds. Throughout the whole adventure, girls experienced historical sites like the Freedom Tower, the Statue of Liberty, Ellis Island and the Charging Bull on Bowling Green. At the end of the day, even though my feet hurt from all that walking, it was an amazing experience that I would recommend for every Senior and Ambassador Girl Scout. It was not only a pleasure to get to know some of the Girl Scouts that I serve, but I learned some history about a city that is so close to where I live. I highly recommend this program to all Girl Scouts when they reach the Senior and Ambassador Levels… or if you get a chance, visit these historical sites.